Everyone knows Chicago is known for its deep dish pizza. But not many know that there are many types of styles of deep dish. I’ve got them for you. (Feel free to argue, I’m always looking for new pizza to try out!) My top 2 spots represent two ways to eat deep dish pizza. This is a famous spot for pizza. There are Giordano’s scattered throughout the city. So I thought it would feel like a chain restaurant and not authentic. It felt a little bit like a chain. We went to a location close to the University of Chicago. This meant there were tons of college students there. Be forewarned that the pizzas take about 45mins-1hr to cook, so order early while you are waiting for a table. Giordanos deep dish pizza is more like a pie. It’s loaded with cheese and has a thick crust. It was delicious, but I personally enjoyed their garlic fries more than the pizza. Pequods was literally the best pizza I’ve ever eaten. Maybe because I waited an hour in 45 degree Chicago weather to get inside and eat it. I love this style of deep dish. The crust was soft but not doughy. The cheese would get burnt around the edges creating a heavenly crown around the crust. The thickness was perfect. You could hold it and eat it or cut it with a fork and knife. Pequods is located outside of the downtown area. We took an Uber there and back. It’s in a more residential area. I felt like a local sitting there eating the best kept secret in Chicago while we all cheered on the Cubs game that was playing. If you are going to eat pizza in Chicago, go to Pequod’s. I’m serious, this is a must. There you go, here is a classic and a hidden treasure. In my humble opinion these are the best spots to eat deep dish pizza in Chicago. There are both totally different and totally delicious. 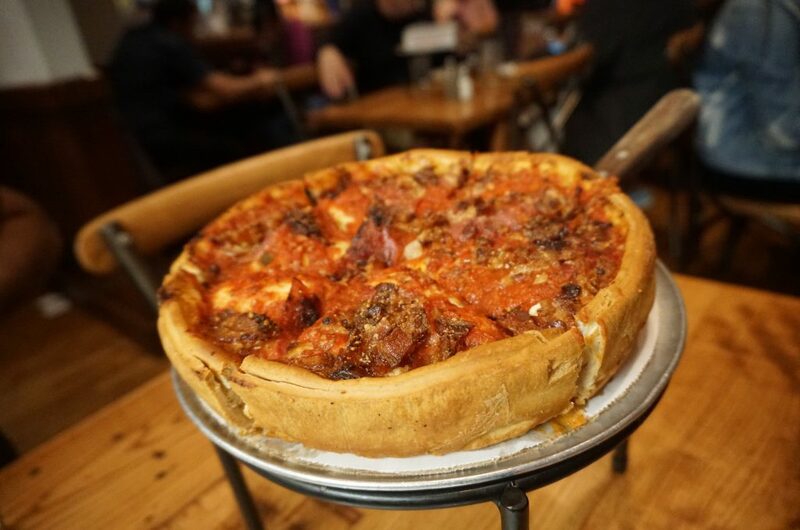 Where have you eaten deep dish and where is your favorite spot?